Award Year: 1997 Significant social policy debate focuses on why the U.S. never achieved guaranteed health insurance for all citizens and whether universal or targeted programs are the answer. The typical American approach is to enact targeted programs and then focus on incremental expansions. Thus the crucial policy question is whether targeted programs can transform themselves into programs with universal characteristics. Dr. Grogan's project centers on the Medicaid program and its evolution from a public assistance program for the indigent to a payer of long-term care services for the middle class. Her objectives are threefold: 1) document Medicaid's partial universalization, analyzing how and why this expansion occurred; 2) evaluate its impact on the treatment of originally-targeted groups and on policymakers' support for the program; and 3) examine whether Medicaid's policy legacy limits the prospects for further expansions to new population groups or for improved services to existing Medicaid groups. 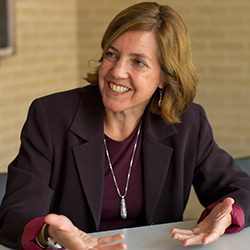 Colleen M. Grogan is a professor in the School of Social Service Administration at the University of Chicago. She is also the academic director of the Graduate Program in Health Administration and Policy and the co-director of the Center for Health Administration Studies. Her areas of research interest include health policy, health politics, participatory processes and the American welfare state. She has written several book chapters and articles on the political evolution and current politics of the US Medicaid program. Grogan is currently working on a book titled America’s Hidden Health Care State, which examines and exposes the historic evolution of public health care spending through private entities in the U.S. health care system. Another project underway focuses on the potential of nonprofit organizations operating in vulnerable communities to address problems of political inequality, and to better represent the poor in health policy decision making. She co-authored a book with Michael Gusmano titled Healthy Voices/Unhealthy Silence: Advocacy and Health Policy for the Poor (2007), which explores efforts to include representatives of the poor and disadvantaged in health policy decision making. She is Editor of the Journal of Health Politics, Policy and Law. Grogan is also the Academic Director of the Graduate Program in Health Administration and Policy (GPHAP) and the Co-Director of the Center for Health Administration Studies (CHAS)at the University of Chicago School of Social Service Administration. Grogan, C.M., Smith, V. From Charity Care to Medicaid: Governors, States, and the Transformation of American Health Care, In A More Perfect Union, ed. Sribnick, E. Philadelphia: University of Pennsylvania Press, 2008. Grogan, C. Medicaid: Health Care for You and Me? In Health Politics and Policy, 4th Edition, eds. Morone, J.A., Litman, T.J., Robins, L.S. Delmar Cengage Learning, 2008. Grogan, C.M. Medicalization of Long-term Care: Weighing the Risks, In Handbook of Long-Term Care Administration and Policy, eds. Mara, C.M., Katz Olson, L. Boca Raton: CRC Press, 47-66, 2008. Grogan, C., Patashnik, E. Medicaid at the Crossroads, In Healthy, Wealthy and Fair: Health Care for a Good Society, eds. Brown, L.D., Jacobs, L., Morone, J. New York: Oxford University Press, 2005. Grogan, C.M., Gusmano, M.K. The Voice of Advocates in Health Care: Policymaking for the Poor. Social Work in Public Health, 2008, 23(4): 127-56. Kandula, N.R., Grogan, C.M., Rathouz, P.J., Lauderdale, D.S. The Unintended Impact of Welfare Reform on the Medicaid Enrollment of Eligible Immigrants. Health Services Research, 2004, 39(5): 1509-26. Grogan, C., Patashnik, E. Between Welfare Medicine and Mainstream Entitlement: Medicaid at the Political Crossroads. JHPPL, 2003, 28(5): 821-58. Grogan, C.M., Patashnik, E. Universalism within Targeting: Nursing Home Care, the Middle Class, and the Politics of the Medicaid Program. Social Service Review, 2003, 77(1): 51-71. Grogan, C.M., Gusmano, M.K. How Are Safety-Net Providers Faring under Medicaid Managed Care? Health Affairs, 1999, 18(2): 233-7. Grogan, C.M., Gusmano, M. Healthy Voices, Unhealthy Silence: Advocacy and Health Policy for the Poor. Washington, D.C.: Georgetown University Press, 2007.